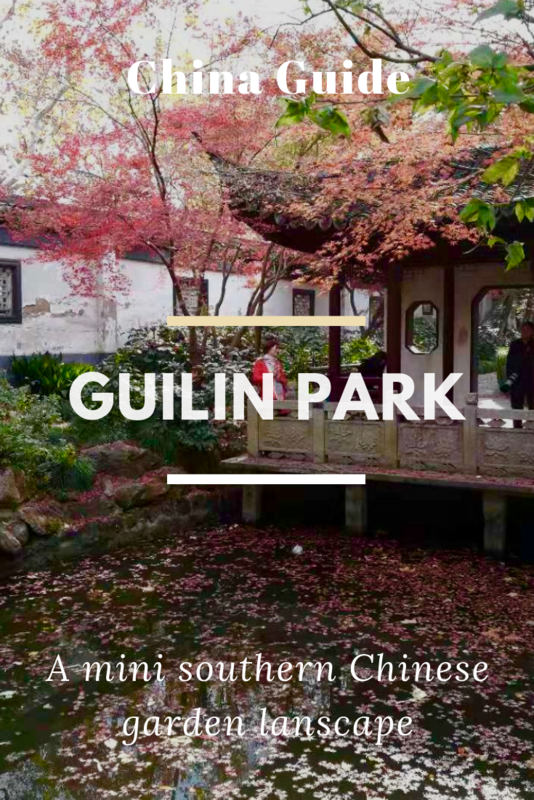 Guilin Park (桂林公园) is one of the best parks in Shanghai and is well-known among the locals only. It is located to the west of Shanghai near Xujiahui commercial district. There are hundreds of parks in Shanghai, classified as recreational parks, community parks, and traditional parks. The Guilin Park is one of the few traditional parks and has a classic southern Chinese garden landscape. In fact, it is a small version of the famous Suzhou Garden style. 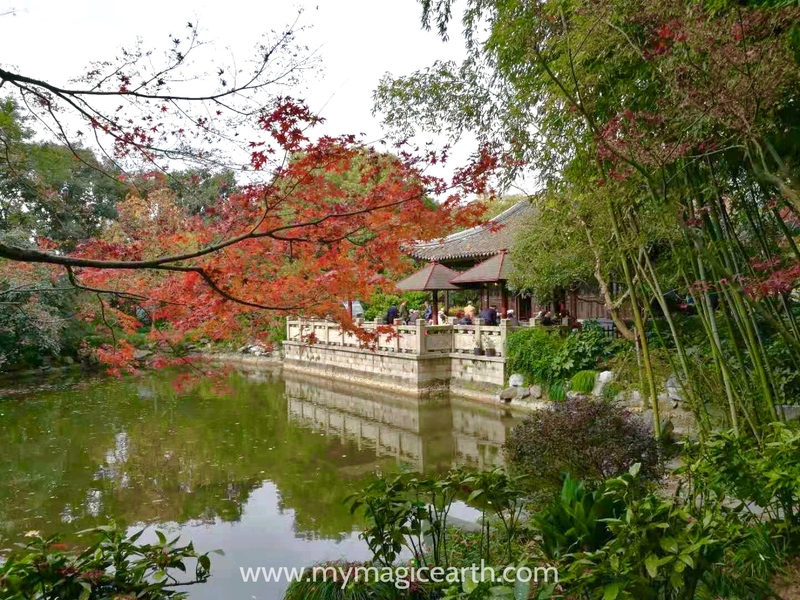 If you visit Shanghai and are short in time to see the Suzhou gardens, this park can give you a strong impression of how a traditional southern Chinese garden looks like. It only takes you less than an hour to complete a round walk. It is also one of the cheap things you can do in Shanghai because the entrance ticket is only two yuan at the time of writing. 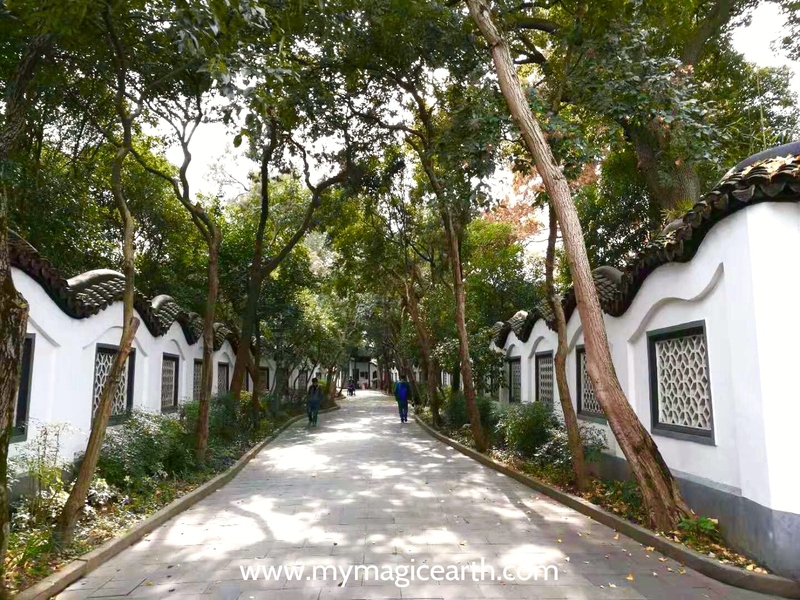 It used to be the private garden of Huang Jinrong, the former Head of the Police Station of the French Concession and the head of Shanghai Gangster. Built in 1931, it took four years to construct the garden on the ground of an ancestral temple and graveyard. To express Huang’s prestigious status, the garden was designed very elegant, delicate and enjoyable. On both side of the main door is the 83-metre long dragon wall. The wall is made of 46 windows, similar to the style of Lingering Garden in Suzhou. The layout of the park demonstrates the profound craftsmanship and an artistic way of simulating nature. 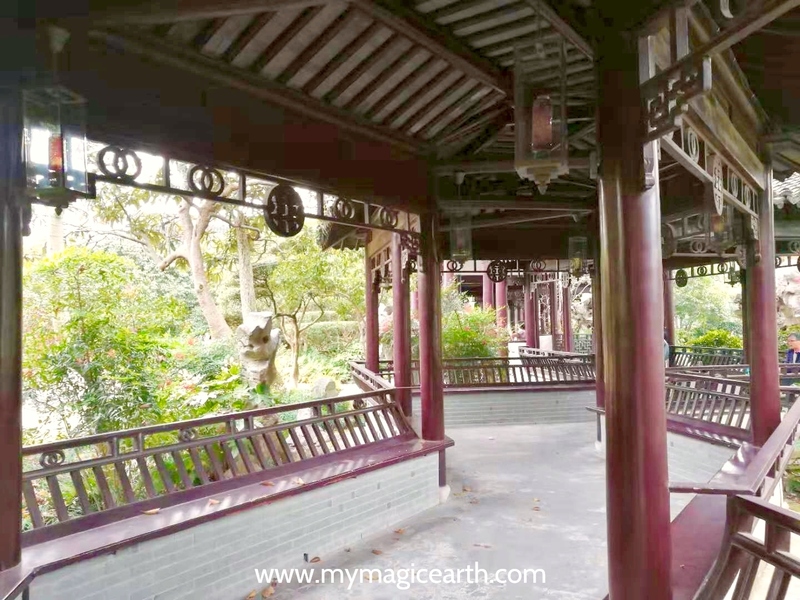 The park has all elements a traditional southern Chinese garden would have. Beautiful pavilions, rock formations, ornamental windows, arched bridges, ponds, and shady walkways, all are nicely designed and arranged. Furthermore, the park is divided into several sections, each with diffident layouts. The buildings’ architectural style is bright. There are 15 different pavilions, next to the ponds, on top of the rock formations, on the bridges, and in the garden sections. The hexagonal pavilion (六角亭) on the right side of the Sijiao Ting (四教亭) is inscribed words written by Jiang Jieshi for Huang Jinrong. And, the long corridor (九曲长廊) will leave everyone a strong impression. Nearly every square metre is used for design purpose. All elements are placed next to each other in harmony. 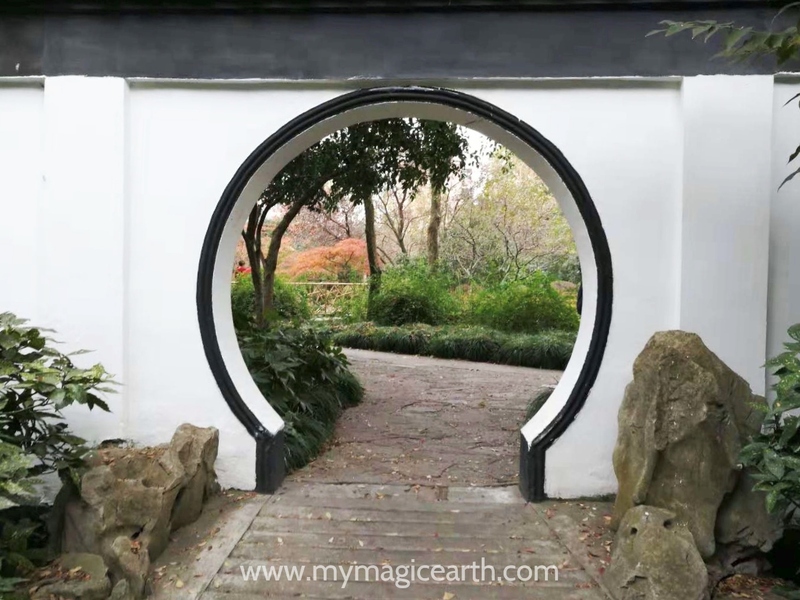 This reflects the Chinese traditional beliefs that a garden is a place to be close to nature, to be in harmony with nature, and to beautify the living conditions. Such a classical garden is also a carrier to express the feelings and place the emotions through its traditional garden elements. Do you know that you can take a hop-on hop-off bus to explore shanghai? 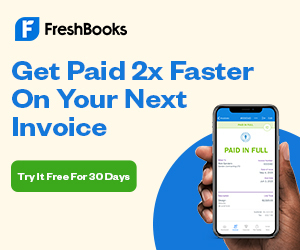 Please click here to take a look. The name Guilin Park, literary means Osmanthus Woods Park (Guilin, 桂林 in Chinese, “桂” means Osmanthus, while “林” means woods). It got its name since more than 1000 Osmanthus trees of over 20 different types, were planted there. These are for example, Osmanthus Fragrans and Osmanthus Asiaticus. Besides, two-thirds of the trees are evergreen, and one-third is deciduous. The park is also famous for its hundred-year-old pine tree and two-hundred-year-old Boxwoods (Buxus micro-phylla). In addition, other plants and fauna such as Peony, Pine, Cypress, White Magnolia, Cinnamomum are also scattered among the buildings. All elements in the garden are unified perfectly together and form a unique garden complex. The Guilin Park is not so close to the residential area. It is usually quite silent compared to other larger neighborhood parks in the city. You can have a break or read o book in one of the 15 pavilions like the locals do. Or, you can follow those winding paths leading to every secret corner while appreciating the garden landscape. Around the Chinese traditional mid-autumn festival, it is also the Osmanthus blooming period. The whole garden is full of sweet scents. Sometimes there are events taking place. If you are with the family, this is a nice place for the kids to play hide-and-seek games. From the kid point of view, this park is like a natural playground. Though it is one of the best parks in Shanghai, many tourists are not aware of it. But it is worth a walk if you are at the west side of Shanghai. Buses such as 830, 909, 224, 732, 43, 92 all stop near the park. Alternatively, you can take subway line 12. Exit the subway and enter the park from the north entrance. The north entrance is at the corner of Caobao Road and Guilin Road. The park also has the south entrance and west entrance. Meanwhile, you can take hop-on hop-off buses to explore Shanghai. 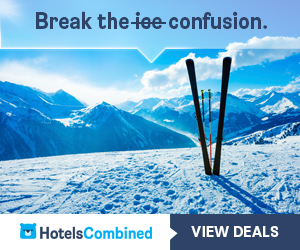 There are 1 or 2-day pass including different city attraction admission combos. The pass is valid on different routes, and you can hop off at any stops to explore attractions by foot with your provided map. On board, you will enjoy informative audio commentary that brings Shanghai’s culture and ancient history to life. The Guilin Park is not a classic tourist destination, so ther eis no stop in front of it. But you can get off at the nearby stop and take the subway to reach there. To book a ticket please check here.